« Anarchist wallpaper #4: Don’t Move for the Rich. Fight Gentrification! 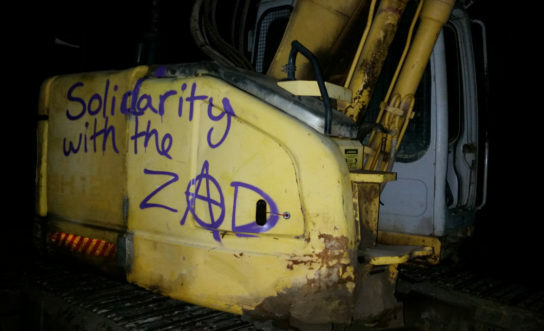 This small gesture was taken in solidarity with la ZAD of Notre-Dam-des-Landes, France, where rebels have fought to maintain an autonomous zone, free from the state and it’s plans for almost a decade. The ZAD was first occupied 9 years ago to prevent the construction of a recently abandoned airport project and has inspired eco-rebels across the world, especially it’s inspiring defense against ‘Operation Ceaser’, a massive eviction attempt in late 2012. Once again la ZAD is facing a fresh wave of repression, in the form of intense both police violence and a recuperative negotiation process which seeks to tame and legalize the uncontrolled zone.